I know I give off the impression here that I spend every at-home waking hour in the kitchen, tinkering with recipes and creating all kinds of exciting delicacies. But that isn’t always the case. Occasionally (okay, very occasionally) I have a life. I come home from work and gasp do thing. Non cooking things. And when I get home late, the last thing I want to do is spend a ton of time preparing lunch for the next day. Lunch? Why is that a big deal? It is. Let me explain. Yes, my coworkers order in daily (or so it seems). Every time I step into the elevator to leave the building, three (or more) delivery men are coming up to my floor. But I don’t order in. Never have, hope never to. It’s more than my ridiculous stinginess. It’s more than my love of cooking. I’ve mentioned before that I lost a ton of weight, and no matter how healthy you think your takeout food might be, it isn’t. And you don’t maintain the kind of weight loss I’ve achieved without being super vigilant about your calorie intake. And that brings me back to my carefully planned, ultra healthy and super delicious lunches I prepare. Often in minutes, because that’s all I have. This recipe is one of those. It’s one of my throw-it-in-the-oven-and-go-take-a-shower-and-come-back-to-take-it-out recipes. It’s delicious, dieting or not. And it’s super quick. Go ahead and try it and let me know what you think! Place cauliflower pieces in a large mixing bowl. Pour in oil and spices, and toss to combine. 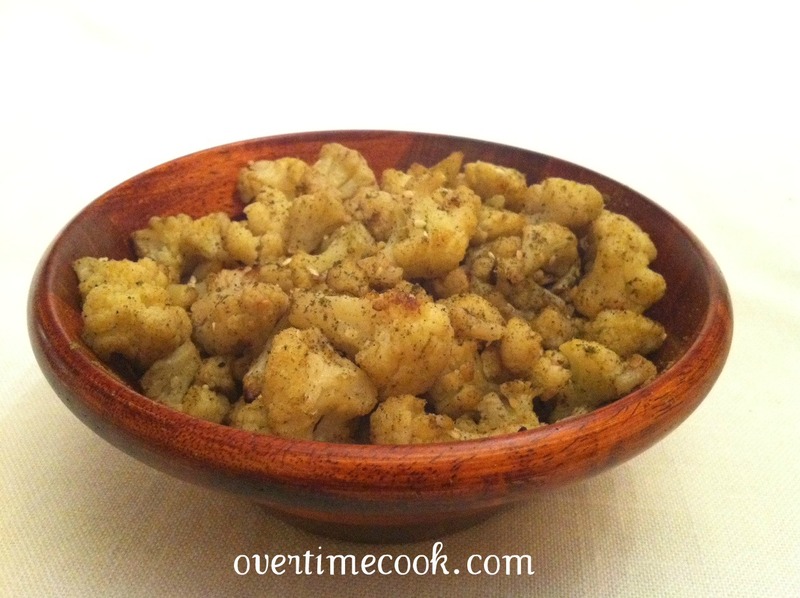 Line baking tray with parchment paper, and spread cauliflower in a single lay on tray. Bake 45 minutes to an hour, or until just slightly brown. I eat this cold, usually, and it’s delicious that way too! *Za’atar is a middle eastern spice blend of sumac and sesame seeds, and is absolutely delicious. If you’ve never tried any, don’t wait- you will love it! Sounds like my kind of thing…although I was never brave enough to try za’atar yet. I just printed it out :). Za’atar isn’t scary! Please let me know how you like the recipe! I got over my za’atar hesitations, and I tried this. It is absolutely delicious! Luckily, I doubled the recipe, because I needed it for the Friday night meal, and I couldn’t stop eating it all through the afternoon. I used fresh cauliflower, but I’m wondering if it’s just as good with frozen. Thanks so much for your comment! Its great to get feedback from people who made my recipes and enjoyed them! And I totally hear you about the double recipe- I never have enough either! Oh, I love throw-in-the-oven-and-go-take-a-shower recipes. Those come in handy. Pleased to “meet” you too Rivki! I’ve got lots more of these recipes up my sleeve…stay tuned! Thanks Shaindy! Let me know how you like it! I did this not too long ago and it was really good! I have never heard of that spice before…sounds so intriguing! Hi Charissa, thanks for stopping by! Za’atar is amazing- especially for folks (like me) who love middle eastern flavorings. Try it and let me know what you think! Hi Christina! Thanks for stopping by and commenting. My local (slightly upper scale) market sells a variety of interesting spices/blends, so I guess I take za’atar for granted, but you can definitely find some online. Delicious and worth a try. 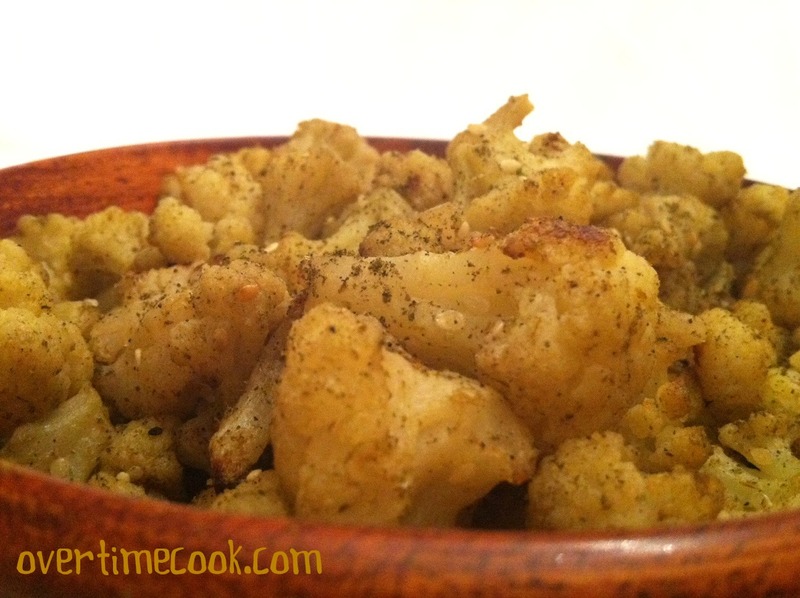 Love roasted cauliflower~have never tried Za’atar but need to. Just thought you’d be interested to know…I make this a lot, usually with fresh cauliflower. I tried it once with frozen, and while it was really, really good, it can’t be compared to the fresh. Za’atar is awesome – but only when it is fresh. I had some that I had bought and it just had no taste. But my son brought me back some from his trip to Israel and it is out of this world. I’ve been putting it on everything (or at least everything savory) since then. Last night I used it on salad that was just dressed with oil and vinegar – wonderful! I loved this recipe, easy to prepare and full of taste! made a 24 ounce bag for supper and ate most of it myself…. I was wondering if you can use the same seasoning on other vegetables? Do you have other recipes that use za’atar? I have a son that fell in love with the seasoning. Sure! It would be delicious on other roasted vegetables. It’s delicious as a seasoning on challah tops as well! I made this recipe this past shabbos and it was really great. Thank you! Looks delicious! I love za’atar and I love cauliflower. Can’t wait to try it! Do you think it would work on eggplant as well?